This article may contain outdated information that is inaccurate for the current version of the game. It was last updated for 2.7. Opinion represents how much a character likes each other. Having high opinion with someone will lead said character to have friendlier behavior and accept more requests in general. On the other hand, having low opinion may trigger the character to be more hostile, joining factions or plots against you. Opinion is affected by a variety of factors that range from traits to succession law, from diplomacy to events, etc. 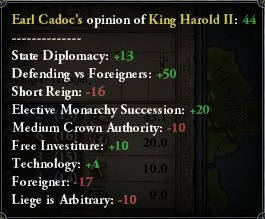 Each different opinions modifiers, along with their reasons, are fully visible to players by hovering the mouse over the tooltip. Find character A in the list, it will indicate their opinion of character B.
Vassals' opinion of their liege will affect how well they fulfill their duties. Liege tax -100 0 At -100 opinion the vassal will not pay any taxes at all. Having an opinion higher than 0 will not grant any additional tax revenue. Liege levy 0 100 Both the min and max percentages are set by laws. Only vassals above (min levies) / (max levies) will provide more than the minimum. For example, with laws setting min levies to 20% and max levies to 60%, vassals with opinion above 33 will provide more than 20%. Piety to liege 0 50 Vassal has an upgraded hospital or temple. Prestige to liege 0 50 Vassal has an upgraded hospital or is a Muslim close relative. Catholic clergy under free investiture who prefer a Pope to their secular liege will pay taxes to him instead, and not provide levies to anyone. A vassal pope who dislikes you will likewise pay no taxes and provide no levies. Vassals of count-tier and above who have a different government type from their liege will have a -20 to their opinion towards the liege due to "wrong government type". Non-feudal lieges may find it more difficult to maximize levies from feudal vassals. Short Reign -2 * (10 - (Years Reigned [rounding up] + Majesty in capital province)) (max +0). Vassals. Tripled for most unreformed pagans; waived for Buddhists and Jains. "One of your vassals has, as their primary title, a title that is my direct de jure vassal"
Ambition opinion is also active against a liege while a character is plotting to fabricate a claim on their liege's title. If a vassal is "-25 Ambitious" toward you and shows no reason to be, they are probably using this plot! This page was last edited on 23 November 2018, at 08:14.